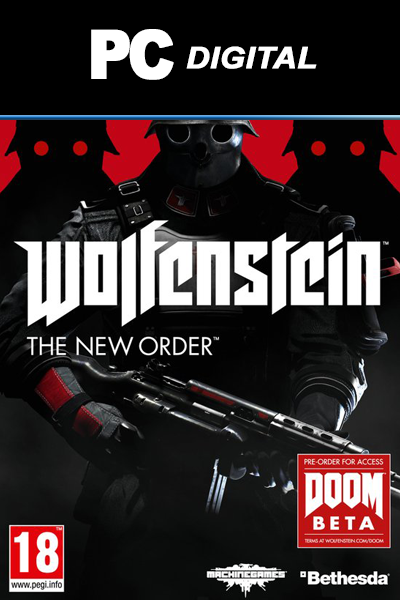 Wolfenstein: The New Order product is a digital code, once bought, the code will be sent to your email or can be downloaded directly from your screen. These codes are original and produced by the developer. These codes have no expiry date. Have you ever wondered what the world would look like if Hitler had won World War II? Experience in Wolfenstein: The New Order! In addition to this game livecards.eu also has a wide range of cards, for example, Playstation, Xbox and PC. Each product can be purchased digitally through our simple 3-step ordering system. It is no longer necessary to go to the store. This is the fastest and thereby also a very safe way to get your new game in the house! What is Wolfenstein: The New Order? It is 1960. A new kind of mysterious and advanced technology has been discovered by the Nazis to use in conquering their most powerful opponents. The Nazi regime now rules the world with an iron fist. You are BJ Blazkowics, the only one who dares to resist the world's most powerful army and the only one who is able to rewrite history. Fights against giant Nazi robots, Super Soldiers and elite shock troops - completely rendered in the new id Tech 5 engine. Experience the most fantastic action-adventure experience with this seventh installment of the Wolfenstein series. How to Buy Wolfenstein: The New Order for the PC? How to buy Wolfenstein: The New Order (uncut) PC? Buying Wolfenstein: The New Order (uncut) PC from Livecards.eu is as easy as 1 2 3! Simply fill in your email address, select a payment method and complete the payment! We have some of the cheapest Wolfenstein: The New Order (uncut) PC on the market.